The new exhibit at Dallas Heritage Village, which features Nash Farm in Grapevine, The Music Room in Duncanville, Frankford Church in Dallas, and the Opal Lawrence Farmstead in Mesquite, will remain open through July 4. 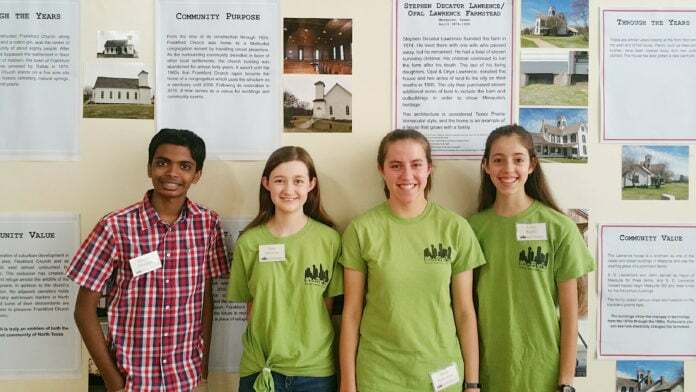 DALLAS—Dallas Heritage Village Junior Historians Kabilan Murugan, 14; Lydia Radke, 15; Sarah Rutherford, 17; and Kara Simmons, 14, recently installed a new photography exhibit in Browder Springs Hall, at Dallas Heritage Village, 1515 S. Harwood St. in Dallas. 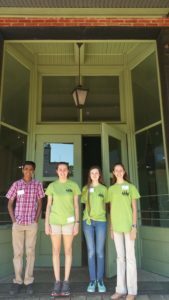 The exhibit, titled “The Path of Preservation,” challenged each Junior Historian – teen volunteers at Dallas Heritage Village with a passion for history – to take a look at preservation efforts in their own neighborhoods and choose a historic area to study and photograph for this new exhibit. Junior Historians Kabilan Murugan, Sarah Rutherford, Kara Simmons, and Lydia Radke in front of Browder Springs Hall at Dallas Heritage Village, where the teens recently installed a photography exhibit featuring preservation efforts in area. Kabilan Murugan, 14, of Lewisville, selected Nash Farm in Grapevine for his project. In 1859, Thomas Jefferson Nash and his wife, Elizabeth Mouser Nash, bought 450 acres of land in what is now Grapevine, and set up a farm. In 1869, they began building the main farmhouse, which still stands today, as does the barn which was first built in 1907. Mr. Nash died in 1906, but the house remained in the Nash family until the 1920s, when John William Nash sold it. In the 1940s, Edwin Pierce Williamson bought the homeplace portion of the farm and modernized it. In 2000, the Grapevine Heritage Foundation bought the 5.2 acre farmstead, including the main house, barn, and cemetery, and restored it to its previous state. It is still run as a farm to teach others about agricultural heritage. Frankford Church was built on a site that was part of the Shawnee Trail, a Native American path. Its use dates back to the 1400s. The location initially attracted migrating settlers due to the nearby freshwater springs, but it was not until 1852 that Captain W. C. McKamy founded the town of Frankford at the location. In 1892, as the settlement grew, he commissioned the Frankford Church building to be constructed by Philip Bethea Hamer in the Prairie Gothic Style to replace an earlier building that was destroyed. More than 100 years after its completion, Frankford Church is a visible reminder of the heritage left by early Texans and their commitment to their community.